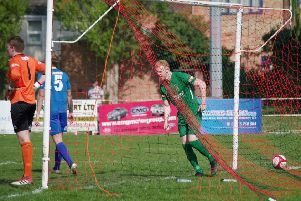 A stunning goal from Ben Wharton was the highlight as Brighouse Town beat Bamber Bridge 2-0 at Hove Edge yesterday. Wharton put Town on the victory trail against his former club with a spectacular half-volley from 40-plus yards over the visiting keeping. Michael Fish cashed in on goal from from Adam Shaw to score the second, off the cross bar, on 59 minutes. Victory has left Paul Quinn’s side eighth in the Evo-Stik Division One North table but they are still four points behind Ossett Town, who occupy the last of the promotion play-off places, with only three matches left. Town are next in action at Radcliffe Borough, who lost 4-0 at leaders Farsley Celtic yesterday and are 18th in the table. They are then at home to Goole on Easter Monday and finish off at Clitheroe on Saturday, April 22.